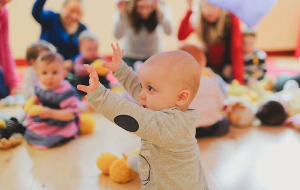 Along with my fellow class leaders Helen and Jen, I am dedicated to providing the very best music & movement classes for young children, with a clear emphasis on making the whole experience fun and educational for both you and your child. We have been running successful classes in the Warrington, St. Helens and South Liverpool areas for over 10 years. Due to popular demand we have now extended our classes to Ainsdale, Aughton Southport and Standish. Take a look at our class schedule to find your nearest class. 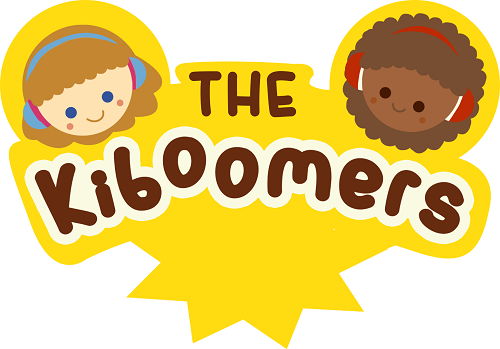 The aim of a Jo Jingles class is to enhance a child's pre-school education by stimulating their interest and enjoyment of music using a series of varied fun-themed musical programmes. We also run sessions in Nurseries, Playgroups, Parent & Toddler Groups and Children’s Centres throughout our areas. So if your setting or organisation would like Jo Jingles to visit please contact me for full details. I was a Headteacher in three different primary schools but now relish being a Granddad to four grandchildren under 4 years of age - all of which love Jo Jingles. Fran has an inspirational character and her welcoming smile makes everyone feel warmly welcome. She has an instant and natural relationship with the children and her lively, caring character makes her popular with all the adults that attend too. Every Jo Jingles session is immaculately planned and carefully balances entertainment, enjoyment and education. The themes capture the imagination of all the children and they become totally engrossed in the sessions. Fran's use of fantastic resources enhances every session. Children's eyes light up when Fran opens her boxes of puppets, musical instruments and clockwork toys. Children and adults are motivated to join in the sessions by Fran's enthusiasm but none are frowned upon if they don't. Her management of the children is excellent she makes each and everyone feel special. Everyone goes home happy. Not only are they extremely well planned, prepared and follow national curriculum guidelines, they are also fantastic fun. Fran has a way of interacting with all the age groups that attend and the sessions allow the children to explore music, songs and instruments in a safe fun environment. 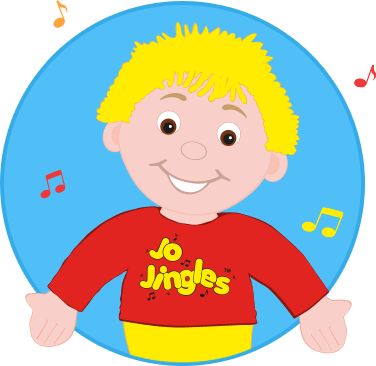 Jo Jingles is an excellently resourced researched and delivered music and story based activity for pre- schoolchildren. My granddaughter and I love it. As Childminders looking after children of different ages we struggle to find groups to suit the needs of all of the children in our care. 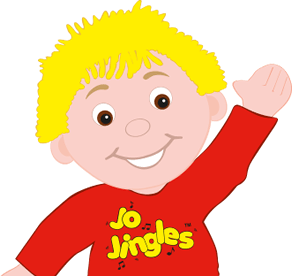 Jo Jingles is one of the few groups that ALL of the children love to attend. As well as it being a fun and enjoyable session it ticks all of the boxes for us as it covers all areas of children’s learning and development. Fran is brilliant and enthusiastic with the children; she runs focused, fun, educational sessions which all of the children love. She is able to maintain their attention throughout the session using different themes, stories, puppets, instruments and many more props. We all look forward to the session every week. 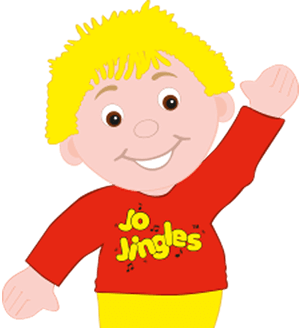 We would definitely recommend Jo Jingles to other Childminders and parents. We think the classes are fantastic....Fran is 'the bee's knees'!! I just wanted to drop a line to say how fantastic Jo Jingles is. I'd never heard of or been to a Jo Jingles class before so i went with an open mind, well it's the best thing since sliced bread. The class is run fantastically well, with organisation and lots of fun!! My little girl has been going along for the past 6 months and has learnt so much, she even took her 1st step in the class! Can't praise you enough! Good work guys! I would like to take this opportunity to thank you for your support during our annual Fun Day. The day was a tremendous success even though we had inclement weather. Your entertainment was by far the best we have had during the 10 years we’ve been running this event. This was very different for the children as it allowed them to interact. I have had some fantastic feedback from the parents; I hope you enjoyed the day and can support us again next year. Once again thank you for your efforts and support which are very much appreciated. On Behalf of the JUMP team. Jo jingles is the first service The Grange Children’s Centre commissioned when it opened five years ago and we have booked 2 sessions every week since. It is by far our most popular and well attended session and a gateway to all of the other services. Parents and children are so happy and satisfied with the Jo Jingles session and Fran’s fantastic approach that they are really open to accessing other services. There is a constant demand and waiting list. As a children’s centre our priority is to improve outcomes for children under 5 and we concentrate on personal social and emotional development (PSED) and communication and language (C&L) as some children in this area score low in these area when they start school. These skills are essential for school readiness. Jo Jingles sessions provide an abundance of opportunities for parents and children together to develop in these vital areas of learning. Each session is meticulously planned by Fran to include occasions where children develop auditory skills, use of rhyme and repetition, concentration and memory progression. 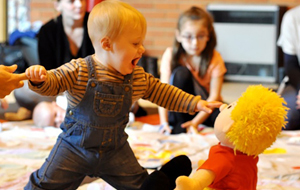 It is a fun filled session with a variety of themes, props, musical instruments, nursery rhymes, song and dance. It cultivates in children a natural love of music and rhythm and encourages parents to sing and dance with their children at home. Parents consistently report that children ask for ‘Jo’ at home. The structured routine encourages children’s turn taking and sharing skills and concern and respect for each other. At the same time parents develop positive relationships with their peers and a sense of belonging and community. I do not know enough superlatives to use in describing the fantastic impact Fran and Jo Jingles have made on the children’s centre. It has increased our attendance figures, enhanced our reputation and helped in ‘word of mouth’ marketing. It is so much more than a fun filled, energised music and dance session. There are so many of these offered to children’s centres with free taster sessions but none of them come close to Jo Jingles in terms of quality, value for money and professionalism. Fran is wonderful with the parents and they have the utmost respect and regard for her. I cannot recommend this service highly enough. Ince Children’s Centre locally commissions Jo Jingles to deliver sessions at the centre, 2 times a week. The sessions are very interactive, enjoyable, very popular with high demand and we feel it helps us to engage families into the centre. Children have a clear opportunity to learn and develop during the session and that they are able to enjoy and achieve. They help the children to develop their Communication, Language and Literacy, their Personal, Social and Emotional development and encourage them to develop their Speech and Language development. Having rich and stimulating sessions such as Jo Jingles has helped increase membership and access to services in our centre and area. The sessions are value for money and are of quality and a valued resource in the centre. The facilitator of the session Fran is amazing and is extremely fun and energetic, which is what we require for the session with our families. She is really welcoming, supportive and accommodating to all our children’s, young people and families and we truly value her expertise in delivering such a rich and quality session. When conducting evaluations on the session we always receive excellent and positive feedback from both parents and children. Both parents and children are smiling, happy and positive when they come out of the session. This tells us the sessions are enjoyable. A summary of feedback below; (best parts of the sessions). Its great, keep it going! My son thinks Jo Jingles is brill! I feel the sessions have really helped my children’s attention as it changes activities very quickly and the leader was full of energy and enthusiasm! May I take this opportunity to give huge thank you to Fran and the Jo Jingles team in all their hard work and support they have given us over the past years. We truly value your time and efforts.